John Adams autograph letter signed ''John Adams'', regarding the Stamp Act Congress, the colonists' response to the infamous Stamp Act of 1765. This Act was one of the first legislative measures passed by Great Britain that taxed the colonists, an act which set in motion events leading to the Revolutionary War 10 years later. 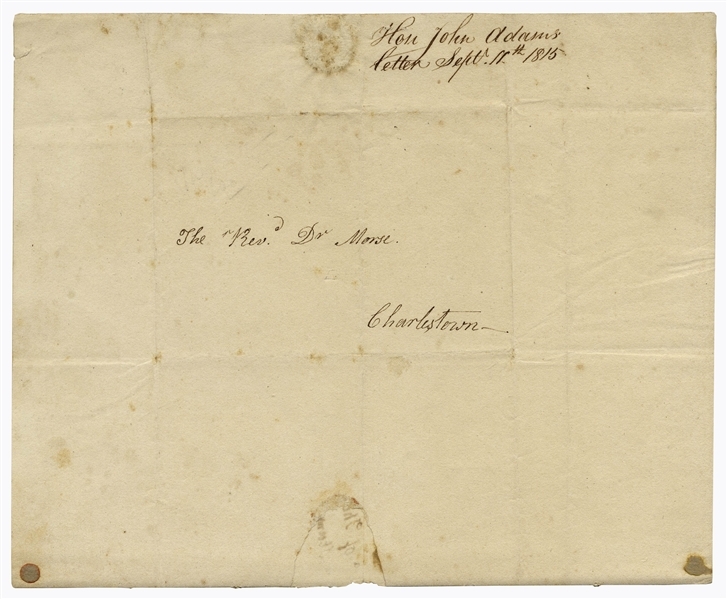 Adams writes to Jedidiah Morse regarding Morse's work, ''Annals Of The American Revolution'', an important record of the Revolution published in 1824, and refers to his role in the Revolution, ''Five and Forty years ago''. 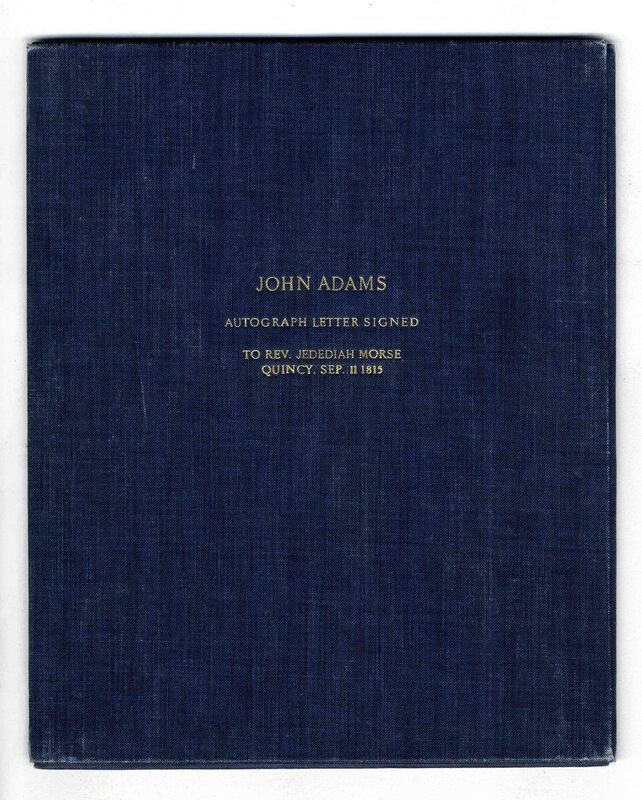 From his home in Quincy, Massachusetts on 11 September 1815, Adams writes, ''For some time past I have been unable to read or write or see, so that it has been impossible for me to answer your Expectations as I wished. And now it costs me more pain and time to write a line than it did but seven years ago to write a page. You will find me but a miserable resource for information or advice in your great Undertaking. I can give you nothing but broken hints. 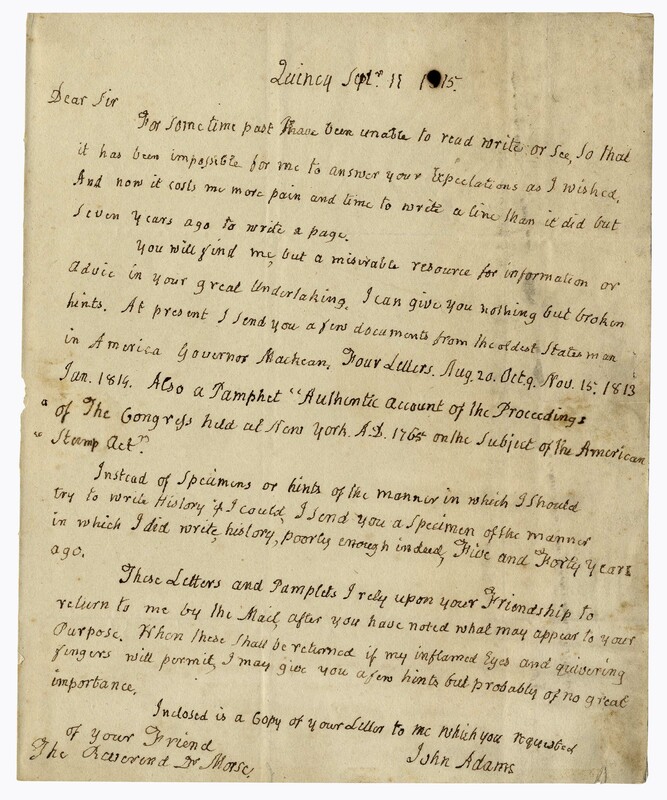 At present I send you a few documents from the oldest States man in America Governor Mackean, Four Letters Aug. 20. Oct. 9. 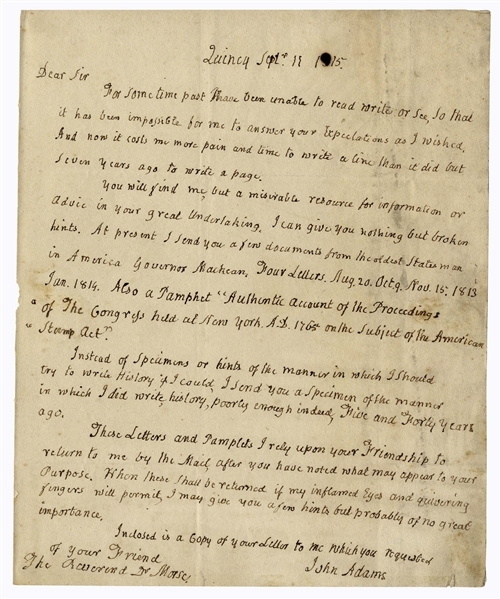 Nov. 15, 1813 Jan. 1814. Also a Pamphet [sic] 'Authentic account of the Proceedings of The Congress held at New York. 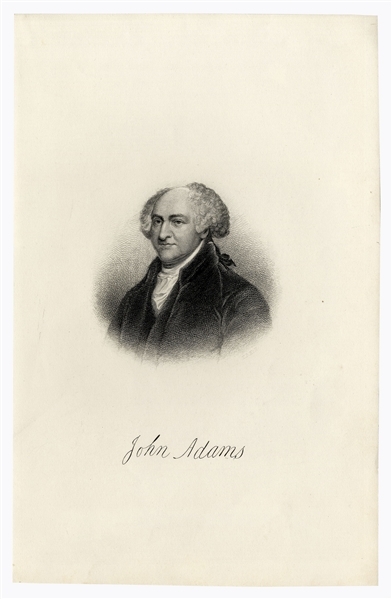 A.D. 1765 on the Subject of the American Stamp Act.' 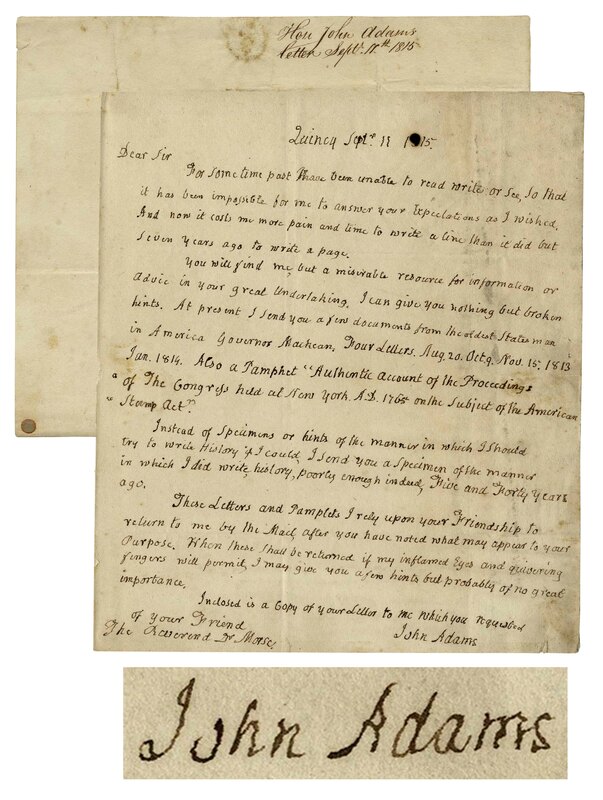 Instead of Specimens or hints of the manner in which I should try History if I could, I send you a Specimen of the manner in which I did write, history, poorly enough indeed, Five and Forty years ago. These Letters and Pamphlets I rely upon your Friendship to return to me by the Mail, after you have noted what may appear to your Purpose. When these shall be returned if my inflamed Eyes and quivering fingers will permit, I may give you a few hints but probably of no great importance...John Adams''. 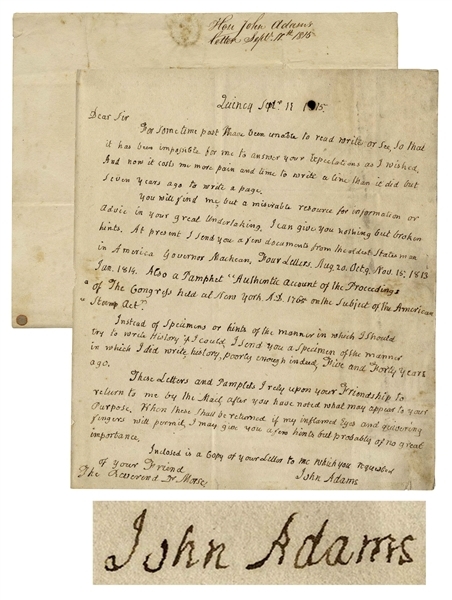 Single page letter measures 8'' x 9.75''. With integral address leaf written in another hand. Light soiling and small paper loss from seal, otherwise near fine condition given age. 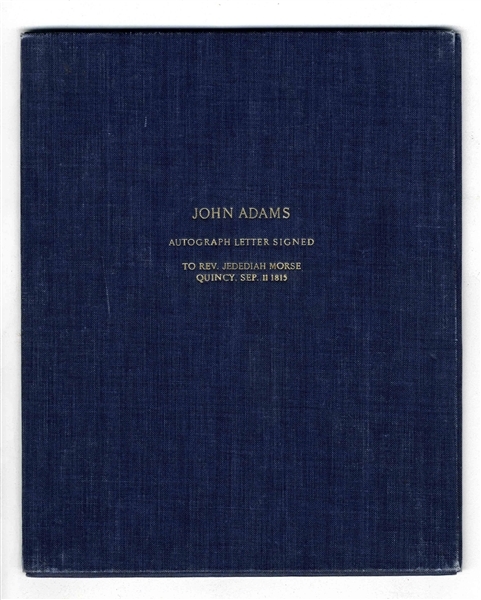 Accompanied by an engraving of Adams for framing, and housed in attractive custom clamshell case lettered in gilt on the front.